Mobile Virtual Network Operators (MVNOs) function as mobile operators without actually operating a mobile network. They do this by reselling service from an actual mobile network operator like AT&T, T-Mobile, Sprint or Verizon. There have always been a lot of AT&T and Sprint based MVNOs but relatively few based on T-Mobile. The Tracfone companies, including Net10 and Straight Talk have long offered T-Mobile based phones. But the only other T-Mobile prepaid MVNO that I was aware of until recently was Simple Mobile, which was acquired by America Movil in May, 2012. That's changed in over the last couple of years with the launch of Ultra Mobile, Ting GSM, Red Pocket GSMT, US Mobile and Lycamobile. Here's a table comparing T-Mobile's own prepaid monthly plans with those of the T-Mobile MVNOs that offer monthly plans. Except as noted prices include all taxes except ones collected at point of sale such as state sales taxes. (7) NET10 and Straight Talk adds taxes and fees averaging $1 - $2/month. They can be avoided by using top up PINs from Walmart, Callingmart, eBay, etc. (9) Straight Talk $55 plan unlimited data subject to deprioritization after 32 GB, video streams at 480p. (10) T-Mobile $45 plan gets 50 MB of data roaming per month. $55 plan gets 100 MB of roaming data per month. $75 plan gets 200 MB of data roaming per month. Hotspot usage is allowed on all plans. Hotspot on the $75 plan is unlimited at "3G" speeds. (11) Includes international calls to a limited number of countries and numbers. See Updated: The Best Prepaid Mobile International Voice & Text Deals for details. There's also a $2/month service charge and taxes and fees that add an average of 9% to plan costs. 14 Republic Wirelesscollects the usual sales taxes and e911 fees plus pass-throughs of regulatory costs and fees. Customers have reported taxes of between 10% and 30% depending on state and locality. Some of the T-Mobile MVNOs offer pay as you go plans as well. The table below compares them with T-Mobile's own prepaid plans. Except as noted unused balances rollover if you top up before service expires. (1) Balance never expires provided an outgoing call is made or text message sent or data is used at least every 90 days. Minimum top up is $10. T-Mobile, like Sprint, has a much smaller network than AT&T or Verizon. You can generally find T-Mobile service in cities and most medium sized and some small towns and along major interstates. T-Mobile Prepaid and some of T-Mobile prepaid MVNOs do offer roaming, but most do not. T-Mobile Prepaid (PAYGO Plans), Ting, MetroPCS and branded feature phones only on TracFone, Straight Talk and NET10: extensive voice and SMS only roaming. Ultra Mobile, Lycamobile, RedPocket, Walmart Family Mobile, Simple Mobile; TracFone, Straight Talk and NET10 smartphones and BYOP; and GoSmart Mobile: no roaming. Here are a couple of maps comparing MetroPCS's voice coverage, which includes roaming with that of GoSmart Mobile's, which doesn't. Click the maps to view full sized interactive version that lets you zoom in to see block level coverage. T-Mobile Prepaid (also Ting GSM, Republic GSM, MetroPCS) gray is no extra cost voice & text only roaming. Lycamobile $45 and higher plans include 200 minutes and 200 texts of off network roaming per plan month. Data roaming is not available. Ultra Mobile (also GoSmart, Simple Mobile, SpeedTalk, Red Pocket GSMT, Lycamobile ($45 and lower plans); and T-Mobile and MetroPCS data).No voice, text or data roaming. Good deals for unlimited talk and text with varying amounts of data at various price points, include Red Pocket's $20 500 MB, $30 1.5 GB plans Lycamobile's $19 500 MB, $23 1 GB and $35 6 GB plans, Ecomobile's $30 2 GB plan and MetroPCS' $40 6 GB amd $50 and $60 unlimited unthrottled LTE plans. For very light users the best PayGo plans are SpeedTalk (data) and Lyca's (no data). T-Mobile's Pay As You Go (really a $3/mo monthly plan) is a good option for light users who need roaming. Updated 3/1/2018: Lycamobile plan changes. When the heck is Ultra mobile going to offer their PAYGO plan??? This month supposedly. I'll believe that when I see it. I hope so... One more thing, in the recommendations part I think you meant "unbeatable deal" and not "unbeatable data"
Or as I do, Google Voice + GrooveIP on my Nexus 4. FTW! Only one I don't trust is Solavei. My boyfriend told me you are better off going with T-Mobile directly. He said it's network is really slow. So he says going with T-Mobile's $70 plan is better. He pays for my phone and I don't b*tch about it. I don't leave out of state. So where I live, I pick up great T-Mobile coverage. Been using Solavei for about 3 months now and so far it has been good. Data speed reaches around 10-13MB DL at times in Nexus 4 in NYC. Even when i had gone on trip to Colorado i was getting coverage & decent speed in the plains. Their only drawback is they charge tax in NYC unlike Simple Mobile/Ptel that comes out to be $10pm thereby reducing one of the advantages of going prepaid. Remember, coverage is limited to T-Mobile's native network with no roaming on all the MVNO's. Quite limited like Sprint's native network. Hence off a major interstate or a trip well into suburbs, NO SERVICE. Counts as well with some states too. Solavei offers roaming, as the article says. Straight Talk, NET10 and Tracfone offer roaming, as the article says. Minimum cost per month with Spot PayGo is $1.67, not $2.50. Add at least $5 every 90 days. You are right. I've updated the post with the correct information. You must make (or receive) at least one billable call during your 90-day Spot PayG0 service period, according to the Welcome letter. If not, the Terms of Service say you will be deactivated and lose your phone number. If you refill early, your Service End Date will be extended and you will have more time to make or receive a billable call. T-Mobile, like Sprint, has a much smaller network than AT&T or T-Mobile." That should say "T-Mobile, like Sprint, has a much smaller network than AT&T or Verizon." Great write-up. Unfortunately the data column of the top table is hiding behind the sidebar. Perhaps something could be done about your wide left and right margins. I can't reproduce that in the current versions on Chrome, Firefox and Opera on Linux. Or with Chrome or IE9 on Windows 7. What browser, version and OS are you using? Looks fine with Safari, Firefox and Opera on Mac OSX 10.6.8 and 10.8.2. It even looks good in IE6 on XP. aap try setting your browser's zoom level and/or text size to the default (normal, medium or 100%). On iPhone 3GS running iOS 6.0.1 stock browser, can't see full width of table with either mobile or web view of page. Cannot pinch table to zoom out. Fit zoom screen button does not go far enough. Table looks good on Froyo 2.2 with either Opera or stock browser. On the latter, you have to push the page left and right to see full table, in either mobile or web view. I was able to reproduce the table truncation issue with the mobile version of Prepaid Phone News using the Android Gingerbread browser. I've made a fix that forces the tables to fit the screen width. It's kind of ugly, especially in portrait orientation, because text in the table cells now wraps in the middle of words on small screens, but at least you can see all the data now. If you'd rather view the table formatted normally on Android, scroll to the bottom of the screen and tap the "View web version link". You will need to zoom out or scroll sideways to see the whole table. I will check the page on iOS at the Apple Store latter today. Your fix works for me on iOS 6.0.1 stock browser. Has the 'kind of ugly wrap' in mobile view, but works perfectly in web view, with full pinch and spread support. I also got a good result with the stock Gingerbread browser, mobile or web view. Same results using Firefox on Gingerbread 2.3.4. I just activated a Ptel GSM SIM for my iPhone 3GS. I am 20 miles outside of the closest area that Tmobile says they re-farmed 3G to the 1900 channel. I guess they are really making progress, even since the 12/20 announcement of 37 markets re-farmed. 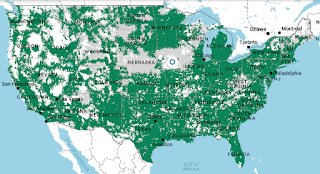 How does the coverage map with Simple Mobile compare? Identical to Ultra and Go Smart. Do you have any news on telcel america? Telcel America is using AT&T, not T-mobile. Nothing new at Telcel America since I wrote Telcel America - New Tracfone Brand Now Available in October. Same plans, same three phones and T-Mobile based BYOD SIM. I didn't include Telcel America in this post because the post is too long already and Telcel America's plans and pricing are identical to Straight Talk except that Telcel America allows international texting on all phones and SIMs and Straight Talk only allows it on Sprint based phones. Telcel America doesn't use AT&T except for some roaming. The SIM and two feature phones are on T-Mobile and the Samsung Precedent Android phone is on Sprint. Solavei now offers a $100 service credit over the first 6 months if you buy their basic ZTE android phone for $100. Are they not aware that TMo has been refarming their network? Spot Mobile is to offer $25 unlimited talk/text in January. Idk if Ultra is going to move on their 5 cents everything paygo plan. Ultra is being outstripped at every turn by its fellow Tmvnobile brethren. It had better offer something different or it is in trouble. The $25 unlimited on Spot is for 15 days, not 30. Will there be an AT&T MVNO Comparison too? Thanks in advance. This is great. Any chance I can find a comparison of all Sprint MVNO's in here or somewhere on the net?. Nope, I only see monthly plans there. The FAQ on the support page says "PAYGO - Our PAYGO plan is coming soon. We will update this FAQ once we launch PAYGO." PAYGO is pay as you go... By the minute or by the month, it's still pay as you go. PAYGO or pay as you go traditionally means that you are charged only for the minutes, texts or MBs of data used. Unused cash balance rolls over when you top up. Ultra's current plans are Prepaid Monthly Plans. Where you get a fixed bucket on minutes, messages and MBs per month. The monthly bucket is use it or lose, unused balances do not roll over. For $49pm They include up to 4G data, throttled after 1gig. I did a speed check here in Vegas shortly after I was activated at about noon, and got 7.44Mbps down & 2.09Mbps up.. great! Just thought someone might like to know! Yeswap, I'm not sure if you've ever been asked this but why do major carriers give business away to MVNOs? In the above case why wouldn't T-Mobile want to try to keep as much MVNO business as possible? They wouldn't do it if it wasn't profitable. The MVNO handles the costs of customer acquisition, billing and customer support which are large and unpredictable. The MNO sells the MVNO service at a markup that guarantees them a profit while the MVNO takes the risk. Also it lets the MNO reach customers who can't afford the MNO's own branded service without having to offer lower prices to it's own customers. Yeswap, what does "MNO" stand for in your above reply? Mobile Network Operator, the one who owns the network T-Mobile, AT&T, etc. All T-Mobile MVNO's have absolutely horrid customer service except for SPOT mobile and Ultra.me I have called all of them. Ptel has very good customer service, in my experience. Spot Mobile has been trying for 6 weeks to fix their online account software, and has not been able to reset my PW or delete my online account during all this time. Please correct the UnlTnT plan chart to show that Solavei has a 4GB cap before throttling within a billing period. Speed returns when new period begins. Ultra Mobile has a new $59 plan that includes 2gb of data before throttling. $49 and $59 plans include $20 ILD credit. It took Spot 12 weeks to reset my account challenge question so I could reset my pw. I followed up politely many times. Then their system did not email me the new pw. They said I had to wait 3 business days more before they would do anything. After the 3 days they said pw reset was working, but I still did not get the new pw (not in junk or spam folders either). The only way I could get it was for them to change my account email address to their address, then forward the reset email to me. I tried entering my other email address once I logged in, and I still could not reset and receive a new pw. I think there is something about their back-end system messages that causes them to be treated as spam and deleted by my ISPs. They now ignore my requests to send a new account pw one last time, so I am locked out of my account permanently. keep you posted and updated on the website." If this is true, Ultra is still a work in progress. What about adding the MetroPCS plans, at least as a comparison. According to the FAQ on metropcs.com, the same plans will be available for MetroPCS customers as exist now at MetroPCS, and the "new, faster network" will be available (at the same prices) for those who buy phones compatible with the T-Mobile network when the merger is complete sometime in 1H2013. This would make MetroPCS effectively nothing but an MVNO, but perhaps the best-priced one at $40 for unlimited everything and 500MB of high speed data before it gets throttled. And that's $40 with all taxes included. AND you save $5 per phone if you have multiple lines, so two people could have unlimited everything and 500MB 4G data for $70 total, including taxes. Also an interesting addition might be which plans are tax-inclusive or not. That can easily make a $50 plan closer to $60. This is a great list. Thanks for compiling it! The MetroPCS T-Mobile deal still has to be approved by shareholders which is not a sure thing. 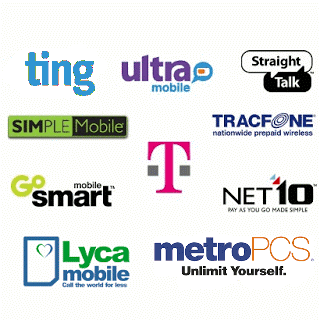 If and when Metro starts selling service on the T-Mobile GSM/LTE network I will add them here. AS far as I know, all the carriers plans listed here are tax-inclusive except for Solavei and in some cases StraightTalk . I'll add notes about taxes and fees for them. You're absolutely right. The deal isn't technically approved yet. It looks like it probably will, though, and I'm personally trying to decide whether to jump on one of these options above or stick with MetroPCS and wait until the new network is available. If one of the MVNO's had a better plan I'd go ahead and jump now, but it looks like MetroPCS will have the best MVNO pricing once all is said and done. Just wanted to make a note of that. As for the tax/fee info, that will be very helpful. For Solavei I've heard some say that increases the cost to the $55-$60 range and all of a sudden their pricing isn't all that hot anymore. Thanks!!! Thanks for the tax update!!! Are you aware of any of the plans being inclusive of state sales tax as well? In the MetroPCS example again, it includes ALL taxes, including state sales tax. I didn't know if all the plans above require payment of state sales tax, or if some of them had it included like MetroPCS. When you top up online, most MVNOs only charge sales tax in the state where they are based. For example, PagePlus offices are in Ohio so only Ohio residents pay sales tax when ordering refills online. 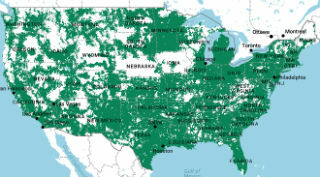 Mobile network operators; Sprint, T-Mobile, AT&T and Verizon have a physical presence in all the states where they offer service so they charge everyone applicable sales tax. I didn't know that MetroPCS doesn't charge sales tax as I live in California, which has no sales tax on prepaid airtime. I wonder how they do that. Do they discount the plan price by the tax amount? For example, if the plan price is $40 and the sales tax is 10% do they charge about $36.35 for the plan + $3.65 tax so the total is $40? Yeah, I'm sure they're PAYING sales tax to the state and they just bundle it in to the price. What I know for sure is that I've had MetroPCS for years, and they simply auto charge my credit card, and my bill is exactly $40.00 every month, not a penny more, not a penny less, and they specifically advertise it that way. Actually, it's $35 every month now because if you add a second line every line gets a $5/mo discount. Also, I'm from Texas and if I try to buy a Straight Talk 30 day card on walmart.com and put in Texas as my delivery address, it tries to charge sales tax, so apparently this kind of service is not tax free in Texas, but MetroPCS still isn't charging me (directly) for it. Anyway, I know that MetroPCS is NOT a T-Mobile MVNO yet, but it will be a pretty a good deal if we end up getting unlimited everything with 500MB of 4G data and ALL taxes, even sales taxes, included for $40, or $35 each if you buy two. Or $50/$45 for 2.5GB 4G data, or "unlimited" for $60/$55. It's not prepaid, but the no contract Wallmart Family Mobile plan at $40 gives 1GB of 3G data. This plan gives roaming for voice and sms, and maybe 2G data as well. With taxes, it probably compares to the GoSmartFamily Mobile $45 plan in price, but offers a different mix of features. Anybody using this plan? GIVmobile was launched by Ptel on Weds. Same unlimited plans as Ptel, but they donate 8%, up to $50/year to the charity of your choice. You help them choose future charities. I check Ultra mobile once a month, just in case they have finally started the PayGo plan. Today I noticed their headline: Monthly Plans for Everyone. I won't be checking any more. Hi and thanks for all the great info here. I'm wondering if anyone knows which T-Mobile MVNOs support call forwarding (conditional and/or unconditional). I believe that ptel & Solavei do, but I assume they're not the only two. I'm especially interested to know if Ultra Mobile does. I believe that PTel & Solavei are the only T-Mobile NVNOs that support call forwarding. Thanks for the quick response--I really appreciate it. Solavei is giving $50 to new customers who sign up this month. Simple and Ptel would have given up when you hit Iowa. Virtually nothing across Iowa, Nebraska, South Dakota or Colorado, so you might have had to learn smoke signals. You got to use AT&T for the extra $10. Are the incoming texts on Lyca mobiles PAYGO plan really free? I don't see them mention that on their website. They don't mention it on the Lyca site but multiple Lyca customers have reported that they are never charged for incoming texts. That's Awesome, I just ordered a couple of sims from Amazon and will try Lyca as soon as the sims get here. I'll be sure to share my experience with them here. You now save 12c/month and get 2.5GB of data for $39.88/month. There is a new, $29.88 plan for Unlimited TnT. Save $5/month on each additional lines. These plans include roaming on AT&T towers in many areas, but are postpaid, no-contract plans. How are taxes and fees on these plans? I haven't found anyone using WFM, but I will guess the taxes and fees are the same % and flat amounts as Tmobile postpaid no contract. I read that Tmobile also handles customer service. I paid 12.5% in my state two years ago with Tmobile postpaid. It is probably higher now, at least 50c more for the e911 fee. WFM on Walmart website is also selling the Tmobile iPhone 5 for $629.88. Tmobile just raised the total price on their monthly financing plan to $650. Are there any T-mobile mvnos that allow incoming premium text messages like from a bank? I know Lyca doesn't do that. Are they really premium messages? A premium message is one where you are charged extra like paying 99¢ for a ringtone. Banks usually use 5 digit short codes not premium messing. I've never heard of a bank using premium messaging. Some operators do block some or all short codes. I heard that no short codes work on PTel or Solavei. On Tracfone with a T-Mobile SIM some short codes work and others don't. I can receive messages from Chase Bank on T-Mobile pay as you go. I don't currently have any T-Mobile MVNO accounts to test with. Oh yeah that's what I meant, the short code numbers from companies and banks. I would like to know if unlocked AT&T Samsung Galaxy III does work on T-Mobile service? Would I be able to get 3G/4G on it? I do not think T-Mobile is able to support LTE on it, is that correct? An AT&T S3 on T-Mobile should get LTE wherever it's available but HSPA+ 3G/4G only in refarmed 1900 Mhz markets. Hi Dennis, thanks for the updates. Looks like there is a mistake in the table above - Spot Mobile $24.99 plan does have text, and Go Smart Mobile $25 does not. Swapped? Thanks for noticing that. They were swapped. I've fixed it. i live in NYC,recently i am thinking swiching to Metro pcs or Solavei from simple mobile,because simple mobile here is very slow. i dont use too much data usage,but i just need it fast and better has LTE, can u tell me which one i should have? They both use t-Mobile. I used neither of them but I have a hunch Metro PCS would be better since it is owned by t-Mobile. Solavei is an MVNO with an optional pyramid scheme. Convincing people to switch their cell plan to Solavei sounds like it would' be so easy. MetroPCS has LTE. Solavei doesn't. Free Facebook access on GoSmart Mobile without a data plan, according to Tmobile executives. I guess this applies to the $25 and $30 monthly plans. Dennis can you please update Simple Mobile LTE on the $50 and $60 plans? I've updated it. Thanks for reminding me. Dennis...where did you get this info on pay as you go Lyca mobile plan "Balance never expires provided an outgoing call is made or text message sent at least every 120 days. Minimum top up is $10 and SMS free for receive"? I could not find on the website. Further I found this "2c/min, 4c/text, 6c/MB 4G data (for incoming and outgoing) (from account credit)". Do you think they always update at anytime? "3.4 If you do not use your SIM Card to make a voice call, or send a message or data, or if you do not purchase a top-up using the Top-Up Services, for a period of ninety (90) days from the date you registered or activated your Account or your last use of the Services (whichever is later), Lycamobile will contact you by SMS or e-mail advising you that your SIM Card will be deactivated. Lycamobile will then provide you with an additional thirty (30) days to make a voice call, send a message or data, or purchase a top-up using the Top-Up Services. 3.5 If you make a voice call, send a message or data, or purchase a top-up using the Top-Up Services within the additional thirty (30) day period, your SIM Card will remain active. Any previous credit balance in your Account will remain available for you to use, and you will be able to access and use the Services." Is there any T-Mobile MVNO where I can used a locked T-Mobile phone without getting it unlocked. I am really looking for a good pay-as-you-go prices for my son who hardly uses his phone and we want to stop paying T-Mobile $50/month when his usage was only aboug 30 minutes / month. I got a Lycamobile SIM card and tried that in his phone - but it does not work. You can use a locked T-Mobile phone with any T-Mobile MVNO except Lycamobile. For pay as you go I recommend PTel, or if you don't need data T-Mobile's own pay as you go. We don't need data. But T-Mobile's pay-as-you-go is 33c/min while there are others like Lycamobile and few others for less than 10c/min. If you add $100 to a T-Mobile prepaid account (total, or all at once), your service is good for a year (Gold Status). You pay 10c/minute if you add a $100 PIN, 12.5c/minute with a $50 PIN, good for 3 months before you reach Gold. For the second year, you would only need to add $50 to cover your son's usage at a good rate, and they give you 15% extra minutes, for 460 total, 10.9c/minute. 38 minutes/month average. On days when your son needs data, he switches to the $2 or $3 daily plan and gets unlimited data for that day. Then he can switch back that night to regular PayGo. T-Mobile actually costs less per month than Ptel for your son's use after you reach Gold Status. $4.17/month minimum for the $50 PIN good for a year. You also get free roaming on other GSM networks, which is important for many people who do not stay in cities or major towns, or near major highways. The previous comments are correct. Gold Rewards, which lets you keep your account active for $10/year, roaming and the ability to switch to a day plan for data and/or unlimited talk and text when needed is what makes T-Mobile PAYGO an excellent value for light use. I noticed that 35orless allows WiFi Calling (http://35orless.com/pages/faq). Anyone know if other T-Mobile MVNOs allow WiFi Calling as well? Lycamobile is advertising on their website free calls to other Lyca customers in 17 countries. Is this new? It could be a good way to communicate with friends overseas, maybe even on the $16 plan. Lycamobile has been advertising that feature on their site for about a week. It says "on any plan" but I can't find any other information about the offer on the Lycamobile.us site. Lycamobile is now offering FREE CALLS to other Lycamobile in Austria, Australia, Belgium, Norway, Germany , Ireland, Italy, France, Nederland’s, Sweden, Poland, Spain, Denmark, Switzerland, Portugal, UK & USA. The promotion is applicable for both existing Lycamobile customers and new customers. Promotion is valid from 03-10-2014 to 05/31/2014. New and existing Customers must top-up to qualify for the promotion and will receive free Lycamobile to Lycamobile calls to any Lycamobile for 30 days from date of top-up. Customers must maintain a minimum balance of one penny. Offer is valid for personal use only. After the 30 days free calls the customer must top-up again to continue the free calls otherwise the customer will be charged at the standard tariff. International calls are billed per minute. This promotion is only available to Lycamobile UK customers and is not applicable to roaming calls. I have no idea if the rules are the same in the US. Looks like you are missing Proven Wireless. "T-Mobile Prepaid and Solavei: Extensive voice and data roaming, ,,,"
To clarify, I do not get data roaming with T-Mobile Pay-Go per minute or daily plans. I have not tried data roaming with the $30/month plan. Does that plan include data roaming? Data roaming is only available on T-Mobile Prepaid monthly plans priced at $50 and higher. The $50 Plan includes 10 MB of data roaming per month. $60 and higher plans include 50MB of data roaming. 2G can refer to a number of different technologies. The fastest 2G technology is EDGE which can deliver speeds up to 236kbps but has typical speeds of 128kbps or less. I've corrected the typo in the table that listed the price of Spot's 3GB plan as $49.99. The correct price is $59.99/ Thanks for pointing the error out. My posts from the past 2 days on the AT&T plans page have not appeared why? Are you looking at page 2 of on the comments? That's where the latest ones are including several by "Anonymous". BTW, you can post using any name you want by choosing the Name/URL option in the Reply As or Comment As dropdown. Leave the URL blank if you wish. It's hard to carry on a conversation when everyone's anonymous. I don't think any of them allow it officially. T-Mobile's own prepaid plans $50 and higher do permit hotspot. It's also a $10/month add-on on the MetroPCS $40 and 450 plans. Hotspot isn't allowed on that plan. No one is going to give you unlimited hotspot data. Even on T-Mobile's $80 plan which includes unlimited data, hotspot is capped at 5GB. It supposed to get blocked. 1. Data: Around 500MB for emails, Browsing, Maps etc. I also want to use my Nexus 4 as hotspot to connect my iPad. I'm thinking of buying Lycamobile $29/month plan which will take care of Data/US Calls/texts requirements and will also give $2.5 credit for international calls. My question is whether i can enable tethering through native Android functionality in my Nexus using Lycamobile? If not, whether there is a workaround using apps like Foxfi etc? Also, was anyone barred from using tethering by Lycamobile as their Terms and Conditions prohibit tethering. I suspect that using the Nexus 4 hotspot will be blocked on Lycamobile or any other T-Mobile MVNO. T-Mobile is quite good at detecting and blocking hotspot on plans where it's not supported. You may be able to find a workaround especially if you are rooted and have the time to research and experiment. AT&T seems to be less aggressive at blocking hotspot and tethering on non-carrier branded devices like the Nexus 4 although there is no guarantee it will work. AT&T MVNO H2O has a $30 500MB plan with a $5 international call credit. T-Mobile's $50 and higher and AT&T's $60 plans permit tethering and it's a lot easier to buy SIMs for them than for any MVNO. International calls are expensive without a $5 (AT&T) or $10 (T-Mobile) international add-on. So in that case, I will take Lycamobile $16/month plan for my phone. For my iPad, can I take $15 T Mobile 7 days 1GB plan? Is it allowed for overseas ipads? Also, what about Tablet unleashed plan of T mobile? Is it still available? Are there any hidden charges with these T mobile plans like activation fee or sim fee? T-Mobile SIMs are $10 at T-Mobile stores. The store should be able to activate the 200MB free plan for you. The non-US iPad should be fine. If you use up the 200MB and want to buy the $15 plan you will probably have to go back to the store and pay cash as T-Mobile requires a credit card with a US billing address for online purchases. Is Lyca mobile the only MVNO that won't work with a locked phone? Lyca is the only US GSM MVNO I know of that doesn't work with phones locked to its parent operator. I suggest that you add the Tmobile $35/month plan (no data) to the first table. Does the MetroPCS $60 plan really offer unlimited 4G and do they have a family plan? What are the family plan rates and can I activate MetroPCS service anywhere or only in their home area? You can only activate service in MetroPCS markets. The family plan is a $5/month discount for the 2nd line and each additional line. I don't get it if MetroPCS runs off the T Mobile network why don't they let anyone activate service anywhere T Mobile has coverage? So if you try to activate service where they have coverage but isn't a home market what then? MetroPCS will only ship SIMs to zip codes in MetroPCS markets. If you somehow obtain a SIM I suspect you would be able to activate it anywhere T-Mobile has coverage. I don't have a list of MetroPCS markets but I know San Francisco (zip code 94103) is one of them. Does Net10 cut off your data after 100MB a day like Straight Talk does? I haven't seen any reports of Straight Talk or NET10 cutting off data on T-Mobile SIMs. Does Net10 do that on any network? I've seen reports of NET10 and StraightTalk throttling users on the AT&T and Verizon networks after about 100MB in a day. They don't cut people off anymore, they just throttle you to the point that data is unusably slow. Does Straight Talk really give you 3GB high speed data without a catch? I think it is 2.5gb high-speed. The catch is poor customer service unless you call the Miami office. And they charge some taxes on $45 if you buy direct. Is T Mobile the only one with international calling to mobiles? You can make calls to international mobiles with just about any operator. Some are less expensive than others. See The Best Prepaid Mobile International Voice & Text Deals for some good options. Is there a new plan? Yes, but it is postpaid for now. If you want the prepaid version, you have to wait or use MetroPCS. All four should have decent coverage in big cities. Verizon generally has the best coverage..
Ptel finally increased the highspeed data from 250 to 500mb/month on their $40 plan. MetroPCS is running adds on TV in non MetroPCS markets could they have launched nationwide service? They still will not sell me a phone from the website, since I live in a non-Metro market. Best Buy sells Metro phones locally, so I do not understand that. How long as Best Buy been selling MetroPCS phones in your (Non-MetroPCS market) area? Are Walmart Family Mobile phones locked? Yes, they are locked to T-Mobile. Unlock eligibility requirements or use a paid unlocking service. So a locked Walmart Family Mobile phone can be switched to another T-Mobile MVNO out of the box? I heard about people getting free service with Solavei. Any truth to that? It's a multi-level marketing (MLM) scheme. If you convince enough of your friends and family to sign up and stay on Solavei you get free service and can even make money. Solavei was a good deal when they launched and early adopters made real money. But Solavei raised their prices and cut commissions and most users have moved on. Is using an unlocking service legal? I don't know. It's a legal gray area for sure but I'll defer to the lawyers and courts to determine it's legality. President Obama says he believes it should be legal and I've never heard of an individual being prosecuted in the US for having a phone unlocked for their own use. Does Walmart Family Mobile offer LTE? Why is there an X over the San Francisco area in the T Mobile Prepaid map? That was my location when I did a screen grab of the map. The Brightspot $35/month plan includes 3GB, not 5GB. As far as I know that's correct. There might be some obscure T-Mobile MVNO that supports short codes but none that I know of. I don't know off hand. Is there a specific MVNO you're interested in? Airvoice, RedPocket, H2O, Straight Talk AT&T and TracFone AT&T reportedly support short codes. Probably, I know that Aio and H2O didn't support short codes until recently. Yes, short codes started working on Aio shortly before the name change to Cricket. I saw that. Solavei says it won't effect service, pricing or commision and they expect emerge from bankruptcy by year end. I don't believe that. Almost everybody they owe will take a haircut, perhaps even T-Mobile. Commissions were already cut from $20/month for 3 signups to $5 each. The longer they are in bankruptcy court, the higher the risk of failure. It is hard enough to convince family, friends and business associates to switch their cellphone contract, without the new company being bankrupt. Once a lot of the relatively new customers port out since they don't have much to lose, and associated revenue drops all the way down the pyramid, growth is at risk and the MLM model become unstable. When the next couple of member tiers leave in significant numbers, the model begins to collapse. At that point, reorganization may not be viable, even with a big haircut for everybody. This whole company is based on the confidence and aggressive selling by the 'sales force' members to generate growth, since they do virtually no advertising. When that fails, the company goes down unless they can recast the whole business model. Very hard to do. LycaMobile has dropped the $16 National Plan. Their lowest monthly plan is $29 now. The $16 plan no longer appears in my Safari or Opera browsers on two computers at that address, or on the Home page (delete /national-plans from the URL). Where exactly do you see it? The top National Plan I see in the list is $29. I'm not seeing it anymore, I must have been viewing a cached page. It looks like the $16 plan is indeed gone. Why isn't Ptel's Giv Mobile listed on this page? Lyca mobile as new plans as of July 11, 2014 and some of them look a lot like Simple Mobile's plans but $5 cheaper. Some of the new plans are also a better deal then two of GoSmart's plans. All of the new plans include LTE data and unlimited talk and global text including one for only $23/mo. Compared to GoSmart's $25 plan with no data and their $35 plan with 500MB. Lyca's $23, $29 or $35 plans are a better value as you either pay less or get more data or both with the $23 plan. Lyca's new $29 plan also includes 1000 international calling minutes at least for now. Compared to Simple Mobile's 1GB, 3GB and 5GB plans Lyca's new plans have the same amount of data all with LTE for $5 less. The international calling plans are the same price except Lyca's plans start at $39 with 500MB. I'm not sure but Lyca may have discontinued their Pay as you go plan as it's missing from their website. What type of roaming does the T-Mobile $40 plan include, voice and data or voice only? The $40 plan has voice and text roaming, no data roaming. Does Telcel America have LTE and roaming? T-Mobile based Telcel SIMs support LTE on compatible phones and have some voice and text roaming. The same as NET10 roaming? Does Telcel run on any other network?